Probably the most popular hill station in northern India, Shimla is the capital city of Himachal Pradesh famous for its Mall road, the Ridge, toy train etc. among honeymooners and families alike. Situated at a height of 2200 m, Shimla is one of the most eminent tourist destination in the country. Set amidst beautiful hills and mystical woods, Shimla is one of most aesthetically planned cities in India. An erstwhile summer capital of British India, this town's captivating natural beauty, and the atmosphere are bound to leave any tourist overwhelmed. The well-knit roads, impeccable cleanliness, and an efficient administration make for a perfect combination for any tourist destination in the world. This town has colonial-style buildings alongside the historic temples and the amalgamation of the worlds leaves everyone visiting this region spellbound. Within this city, one must visit the Mall Road, The Ridge, Institute of Advanced Studies and Jakhu Temple. Shimla is also used as a base to cover other nearby places like Chail, Kufri, Naldehra, Mashobra, Tattapani and Narkanda. The toy train to Shimla from Kalka passes through beautiful hills and valleys and is one of the most beautiful train routes in the world. While in Shimla, visit its colder, higher and less crowded cousin, Kufri just 13 km away from the main town. The views and sceneries here only get better, and the landscapes more flattering, a bit untouched with the tourist rush. However, Kufri too is becoming increasingly popular with the visitors, especially due to the zoo here. One must visit Kufri's zoological park which is famous for having rare species of Antelopes, Felines, Bears and birds including Himalayan Monal, which is the state bird of Himachal Pradesh. Mashru peak is the highest point here and one can reach by trekking upto that point. Otherwise, Kufri itself is very cold and is used as a ski ground during winters. There are accommodation options also available here. Wildflower Hall is also located nearby. Set amidst the lush green background of the Shivalik hill ranges on Jakhoo Hill, the highest point in Shimla, the Jakhoo temple is an ancient site shrouded in legends and offers a mystical vibe to visitors. The Jakhoo Temple is dedicated to the Hindu monkey god - Hanuman. The site is one of the most sought-after tourist attractions in Shimla, attracting tourists and visitors of all ages and religions apart from Hindu pilgrims and devotees. This temple has the world's largest Hanuman statue, which is visible from most parts of Shimla. Visit the temple, to view this statue upright and strain your neck a bit admiring its magnificence. Overlooking the sister town of Sanjauli, the amazing setting of the temple in the thick of beautiful Deodar trees is complemented with an abundant monkey population in and around the Jakhoo Hill area which serves as a fitting tribute to the monkey god. It is located approximately 2 kilometres from the Ridge in Shimla's centre, a journey of about 30 minutes. Shimla's most famous temple houses one of the tallest statues in the country, a 33 meter (108 feet) tall Hanuman statue that dwarfs the trees below it. The construction is a marvelous piece of engineering as it is situated at the height of over 8000 feet, making it the tallest statue in the world at such a height above sea level, surpassing Christ the Redeemer statue in Rio De Janeiro which is 30 meters tall (excluding its pedestal of 8 meters), at the height of 700 meters (2,300 feet). According to the legend that surrounds this temple, Lord Hanuman stopped at this spot to take some rest before resuming his search for the Sanjeevani Booti to revive Lord Lakshman. Your visit to Shimla would be incomplete without visiting the scenic Jakhoo Temple! A quiet escape and one of the less crowded attractions of the state, Theog in Himachal Pradesh, warmly wrapped in the arms of the mighty Himalayas, has everything a popular hill station can give you minus the tourist rush. 32 km away from the main town of Shimla, Theog makes up for a beautiful weekend getaway in the hills, comfortably located in the lap of nature. Much away from the chaotic atmosphere of cities and the excited shouts of joy and chatter of popular tourist destinations, Theog can be called an underrated destination, which in fact works in its favour, away from the city jazz and close to the lost tranquilly of nature. The Indian Institute of Advanced Studies located on the Observatory Hill is a majestic structure made with Victorian-style architecture. It has now been converted into an educational institution which offer post-doctoral courses. This building was formerly used by the British Government to hold important political meetings. This is a small and relatively less explored town, at a distance of mere 10 km from main Shimla. Tourists come here to relax and unwind in the lap of nature where the richness in flora and fauna is in abundance. This lush green place has a myriad variety of wild animals and is a haven for wildlife enthusiasts. This place also hosts the annual Sipi fair in June. This small village in Himachali is situated at a height of 2250 m above sea level and is known as a hiker's paradise. Surrounded by lush greenery and mesmerizing views from such a great height, Chail is bound to give a tourist a memorable travelling experience to a tourist. This place is famous for having the world's highest cricket and polo grounds and has a luxurious resort situated on three hilltops. Once the summer capital of the Patiala Kings, the palace has now been converted into a hotel and a tourist destination. This is the quintessential destination for tourists looking for a calm and relaxed vacation away from the more bustling and crowded tourist destinations in this state. Literally meaning hot water in Hindi, Tattapani is a small village located 51km away from Shimla. This place is famous for hot water springs and the famous Shiva caves. Walk through this park, to browse through a modest, yet colorful and vibrant collection of the Himachal state bird, the Monal Pheasant. A high altitude Golf course near shimla, need membership for entry. But you can roam surroundings of Golf course. you can ride by pony or go up by walk. if you are traveling with your kids they can enjoy the pony ride. Naldehra is a very quaint and serene town in Himacal Pradesh. It is of course, known for its 9 hole golf course. It is the best place for you to visit if you think you can splurge a little. However, if you do not want to visit the place for Golf, then you can easily take a walk or hire a pony around te course. It is a lush green expanse and if you have kids going along wit you, they are going to love it. Originally built as a residence of Lord Kitchener of Khartoum, this building is said to have been a favorite retreat of Lord Ripon. However, the building got burnt in 1993 and a new Wildflower building was built as a hotel there by joint venture between HP government and Oberoi group of Hotels. This hotel is located in Chharabra area of Shimla, around 13 km from the main town. The Green Valley is a beautiful and breathtaking mountain range that falls on the way to Kufri from Shimla. This spectacular valley is God's gift to the wonderful and charming city of Shimla and is every tourists' answered prayer to being able to find a place bereft of pollution, constant traffic jams and incessant noise and din. The greenery and beauty of this place is so mesmerising that it make the tourist forget everything else and simply bask in the sheer joy of being in nature's lap. The Green Valley is surrounded by verdant hills on all sides that are covered with thick forests of pine and deodar. It is not uncommon to sight some Yaks wandering and grazing around in the valley. You will also come across some local shacks and markets on the way. The Green Valley is a region that oozes beauty, magnificence and splendour; and hence, tourists love to stop by at this place to enjoy the lush green environs. The scenic beauty and elegance of this valley make it one of the most beautiful and must visit tourist spots all across the country. This is precisely why tourists especially come here to spend some time standing by the road and enjoying the marvellous views that the place offers. The place is also an ideal spot to capture some fantastic pictures. The tall mountains with greenery all around and the distant snow-capped Himalayan ranges make for a perfect background to click amazing snapshots. Even though there is no lodging in the valley where visitors can stay, people do manage to take out some time to soak in the environment and click a picture with their family and friends. The place is undeveloped for tourism, nevertheless, it continues to be a crowd puller and capture the attention of tourists with its natural and pristine beauty. The Green Valley is imbued with natural beauty, as is evident in the dense deodar and pine trees that line the majestic hills. Rare animals are also sighted here at times. This makes it one of the most famous tourist destinations and the most loved photography point in Shimla. The Green Valley, thanks to its beauty and grace, has also featured in numerous Bollywood movies. The Himachal State Museum is located on the Mall Road and has unique collectibles like ancient coins, paintings and other handicraft items, the aesthetics of which are influenced by the Pahari form of art. The museum also has a doll gallery which has several bride and groom dolls among many others which are admired by all visitors. Some archeological artifacts are also found here which include stone images from the 8th century. Kalibari Temple is an ancient place of worship dedicated to Goddess Kali. It was built in 1845 and is considered of immense religious importance for the devotees. The temple exudes a divine vibe of the Goddess and everyone visiting the temple is bound to experience it. The shrine houses a captivating idol of Goddess Kali beautifully adorned with jewellery and colourful flowers. The temple is located in Shimla, very close to the Shimla City Mall and is often visited by devotees in large number. The temple premise is kept clean and is well-maintained, and devotees can sit for hours here absorbing the heavenly vibe. Many prefer chanting or meditating here to contemplate issues they are facing as they seek power and energy from Goddess Kali to face and fight them. Locals believe that Goddess Kali lived on Jakhoo Hill which was the location of an ancient temple that was later relocated to Kali Bari by the British. Locals also know Goddess Kali as Goddess Shyamala. The name of the city, Shimla, was derived from the Goddesses' name. A large number of devotees visit the temple seeking Goddess Kali's blessings and to offer her prayers during the festival of Navratri. The nine days of the festival are celebrated in the divine power of the goddess with great enthusiasm and devotion. The temple premise also has a Guest House and a Canteen for tourists who wish to stay nearby. The canteen serves simple but delicious Bengali food during lunch and dinner time. The evening aarti should never be missed here. The site of devotees getting immersed in the holy verses chanted by the temple priests is another sight to witness. A visit to the Kalibari temple is a must for one and all. Lavi Fair is a unique event held in Rampur Bushahr which is a municipal council in the district of Shimla. It is celebrated every year from 11th to 14th of November and is attended by small and large-scale merchants and businessmen, but is majorly organised to encourage business amongst the locals and the shepherds. Locals celebrate the event to commemorate the Mutual Trade Treaty that was signed between Rampur Bushahr and Tibet. The venue of the fair is on the banks of the mesmerising River Sutlej, and one can get a glimpse of the traditional methods of trade of essentials that include wool, horses, mules, yaks, dry fruits etc. These items are either sold or bartered and the entire experience at the foothills of the Himalayas in November is an exhilarating experience to have. Lavi Fair is also called the International Lavi Trade Fair which has been held in the region for over 300 years. It is considered a legacy of Himachal Pradesh. The rich cultural, social and economic history is celebrated during this fair and hence it is also believed to have high aesthetic significance in Shimla. It is an international fair and people participate in this event with great enthusiasm. The fair serves as a commercial centre to strengthen the bond between the traders and is still considered immensely crucial in spite of the availability of technology that enables connecting with peers at any time. The platform is never missed by the traders as it only helps them build and strengthen the bond on a personal level. Bhoj Fair is celebrated in the Gumman Village in Shimla which comes under the Rohru Tehsil. The fair is a three-day event dedicated to the honour of Lord Banshur/Lord Bansor, Lord Parshuram and Lord Kilbaru. It is held in the month of November every year and is celebrated primarily for the commanding deity or the Kul Devta, Devta Bansor. Devotees from nearby regions visit Gumman to offer their prayers to Lord Bansor. During the fair, the village transforms into a colourful and lively place. Devotees come in large numbers all dressed in beautiful traditional apparel and jewellery. This attraction is a perfect getaway for the offbeat traveller. Bhoj Fair is a call for devotees to offer their prayers and be thankful for the blessings Lord Bansor showers on them. The idol of the prime deity is beautifully decorated with colourful clothing, flowers and garlands and taken out in a procession. Devotees flock in large numbers to carry the idols on their shoulders and get one glimpse of the beautiful idol. Carrying the palkhi that has the idol of the deity on their shoulders is a mark of respect and devotion. The fair also has fun rides, entertainment and the famous traditional Nati Dance. Anyone can join the Nati dancers and become a part of the event. Located in the heart of the 'British Summer Capital' - Shimla, The Ridge is a wide open street located on the side of mall road. The Ridge has everything, from shops selling some exclusive artefacts to the spectacular view of the snow-capped mountain ranges set against an orangish hued sky. It is famous for a lot of things, but best known for shopping. This place is a delight for all kinds of tourists, and the old British establishments beckon visitors from all over to this centre of the beautiful hill station. The Ridge is not just a market place but also the social hub of the city. This wide open space is thronged by locals and nature enthusiasts as well as travellers bored of the sightseeing. The road is lined with cafes, bars, boutiques, shops and restaurants attracting the huge crowd that visit the famous Mall Road. It runs from east to west on the side of the Mall Road and connects it to the famous Scandal Point on the west end. On the east end, it is connected to the Lakkar Bazaar, which is the most famous wooden crafts market in Shimla. The Ridge is the most recognised face of Shimla. It is often the most photographed part of the hill station covered with pine, firs, Himalayan Oak and Rhododendron trees. Shimla's rich past is evident from the Gothic buildings standing in this part of the town. Visiting The Ridge will surely leave you impressed if you are interested in history and architecture. If not, you can always take home your photos set in the spectacular beauty of Shimla, juxtaposed against the snow dusted mountains, leaving your friends and family in awe! The Mall Road in Shimla, located in the heart of the town, is the main street that is lined up with a myriad of restaurants, clubs, banks, shops, post offices and tourist offices. At the same time, the place boasts of the other exciting attractions that it houses, such as the Scandal Point and Kali Bari Temple. One of the busiest and more commercial areas of Shimla till date, this stretch is a mini-world in itself. Mall Road is the one stretch, that truly celebrates the spirit of Shimla, its tourist rush and valleys and hills covered with houses and hotels. The stores that are located on the Mall Road are famous for their woollen clothes and exclusively handcrafted works, apart from the usual books and jewellery. The wooden furniture shops are particularly well-known; so do not forget to buy some exquisite wooden articles, which look like antiques, when you shop from here. Vehicles, except emergency ones, are not allowed on this street, which not only makes the Mall Road an ideal place to stroll around in the evenings, without being concerned about the traffic; but also ensures that the overall environment of the site remains unpolluted and pristine. Other than shopping, the Mall Road is also famous for its variety of cafes and the delicious delicacies that they serve. In fact, people here are spoilt for choice when it comes to choosing a place to have a meal at. The numerous leisure activities that the Mall Road offers ensure that you do not get bored. It would not thus be an over-statement to say that any traveller would love to lose himself here for a few hours, to admire the charisma and rustic appeal of this place. An enjoyable train ride through much of Kalka and Shimla and a little of what the British left behind, this is a must try experience, while here. This route is one of the most picturesque train routes in the world and it passes through more than a hundred tunnels It is a narrow gauge train route and it connects Kalka to Shimla. This route has also been declared as a World Heritage Site. The Scandal Point in Shimla, as the name suggests, is one of the most talked about attractions of this hill station. The titillating title surely piques one's interest, and the gripping story behind it does justice to the intrigue created. Shimla is one of the most scenic hill stations of the north and is renowned for being the perfect destination that packs it all- unparalleled natural beauty, exciting adventure as well as complete spiritual and inner relaxation. The Scandal Point is one such attraction in Shimla whose enthralling scenic beauty stands as a testimony to the city's stellar reputation. Scandal Point rests on the intersection of the city's most roads- Ridge Road and Mall Road. This point is a mountain lover's haven because it enjoys a picturesque and unobstructed view of gigantic mountains covered in a blanket of dense fir and spruce. On this intersection, there also lies a statue of our revered freedom fighter- Sri Lala Lajpat Raiji. Scandal Point is a year-round magnet where people come to relax and rejuvenate amidst the view of the soaring mountains. One can opt for a horse ride at this point, enjoy some hill station Maggi and play some arcade games in the small shops that surround this point. Kufri tends to be a hub of much activity and enjoyment in winters. Skiing is a popular sport here and the town also hosts a winter sports festival in February. A number of setups here provide both training and facilities for skiing. Shopping in Shimla revolves around the heart of the town- The Mall Road. One can shop for local handicrafts, shawls, woolens, exquisite jewelry etc. here. Also visit the Lakkar Bazaar, nearby, where you can find some fine wooden handicrafts as well as dry fruits and natural herbs. these wooden items are very popular in the area and ideal to take back home as souvenirs. Popularly for its rare variety of flora and fauna, this wildlife Sanctuary is a must-visit for all wildlife enthusiast. Animals such as jackals, barking deer, monkeys and leopards are commonly sighted here. The Pir Panjal ranges of Jammu and Kashmir can also be seen from here, making this an ideal spot for trekking and picnics. Horse riding is a popular and much loved activity in both Shimla and Kufri. In Shimla, Horse Riding Options are generally available at the Ridge. While in Kufri one can ride through apple orchards and all the way to the Kufri Zoo. A lot of times, horses tend to be the only means to reach someplace in Kufri. This Gurudwara was constructed in the year 1907, at Padhawa hills. It is a small construction but the exquisite details in the interiors of the structure make it a must-visit for devotees and tourists alike. Located in Chharabara, just 10 km from Shimla, this is the official retreat residence for the President of India. It was built in 1850 and was part of the Viceroy of India property. The architectural pattern and the natural beauty of the place have made The Retreat a tourist attraction in Shimla. 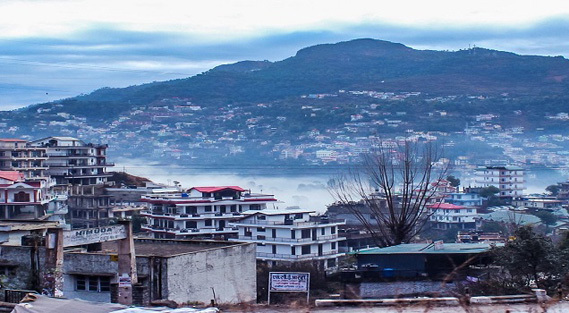 Shoghi, also known as city of temples is also a place to relax through spirituality. This temple considered to be 250 years old is situated on the top of the Tara Parvat. Devoted to the Tibetan Buddhists Goddess Tara, she is believed to be one of the nine sisters of Goddess Durga. The idol of the deity placed in the temple is wooden as believed to be brought by the Sen Dynasty from West Bengal. If you are visiting the town during sharad Navratri, you can also enjoy the special pooja conducted on the Ashtami. Annadale is a famous attraction in Shimla, the capital of the North-Indian state of Himachal Pradesh. Having a splendid golf course, a playground, a cactus museum and an Indian Army museum, it is a beautiful attraction for holidaying and rejuvenation purposes. In fact, during the pre-independence period, Annadale was the most preferred location the British chose for leisure activities like Cricket, Polo, Golf, Dog Shows, Reunions and other social events. The mesmerising location draws tourists from all over the world especially sports lovers who often spend their time playing cricket, golf or polo. Annadale is also a famous picnic spot for the locals. It is often visited by tourists during summers as the weather stays cool and pleasant, allowing to explore the regions at leisure and play a sport or two. It is one of the best places to visit along with friends and family. Precious moments captured here will be cherished for the rest of the life. Today the playground is mostly used for events organised by the Indian Army and as a helipad. The beauty of the location cannot be described through words. One has to visit Annadale to know how breathtaking it is. Chadwick Falls is located in the Glen Forests in the beautiful city of Shimla in Himachal Pradesh. Situated not far from the bustling city area, the Chadwick Falls are frequently visited by picnickers. Some may even prefer walking down to the falls exploring and absorbing every bit of the beautiful natural landscape of the quaint little town. This stream of water trickles from a height of about 100 metres. It is not a massive waterfall but is admired for the tranquillity and the hypnotic vibe it creates amidst the dense forest region. Some explorers recall a walk through the forest as an adventurous experience because of the damp and dark environment created by the thick canopying forest. A perfect place to unwind, Chadwick Falls is frequented for a daytime picnic. Chadwick Falls and the surrounding region is a beautiful retreat for those wanting to escape their chaotic lifestyle. Just pack the essentials, wear your trekking boots and get going. The lush green surroundings, the freshness of the air and the sounds of the wildlife will make one want to come back again. The name Chadwick is derived from 'Chidku Jhaar' where 'Chidku' means sparrow and 'Jhaar' means waterfall in the local language. It was named so because the locals thought only sparrows could reach the top of the waterfall and not humans. The Britishers found it difficult to pronounce this name and hence started calling the waterfall Chadwick. Some say a scientist named Chadwick committed suicide here and therefore it is called so. No matter what the origin of the name is, this beautiful location is a stone's throw away from the city and must be visited by everyone exploring Shimla. Built in the Victorian or Gothic style of architecture over a century ago, the gaiety heritage cultural complex is of immense historical and cultural significance in India. The complex had a theatre, several galleries, offices, bar, and a ballroom. It was a venue for innumerable important social meets back in the time and had all the facilities necessary for making the social events memorable ones. However, today only a few structures are remaining as the rest were weak and unsafe and had to be demolished but what remains of the majestic complex is still a treat to the eyes. Gaiety Heritage Cultural Complex was built in 1887. It was designed by a British Indian architect, Henry Irwin. The theatre at Gaiety Heritage Cultural Complex is where several notable performances were held and enjoyed. Legends like Prithviraj Kapoor, Rudyard Kipling, K.L.Sehgal etc. had given some memorable performances here. The complex was frequented by art lovers and socialites and was an essential part of the lives of the elite class of people and the artists. The complex houses an exhibition hall, a multipurpose hall, an art gallery and an amphitheatre. It is considered as an essential and famous centre of performing arts for artists, and art enthusiasts from all over the world visit the Gaiety Heritage Cultural Complex frequently. This Victorian style theatre gives a glimpse into the importance of art and how it affects the culture of the region. Heritage walk is a guided tour of the Heritage Zone located in Shimla. These walks require exploring the heritage zone on foot to get a glimpse into the rich history of the ancient British town. The heritage walk begins at one end of the city and participants walk to every heritage monument in Shimla. One can choose to hire a guide to get more information and hear exciting stories from the British era. Almost all of the historical monuments in the city are well preserved, and tourists from all over the world visit the city to take a heritage walk. As one explores the Heritage Zone, they will observe the different style of architecture used to build the offices, the castles, the hotels and the cottages. The importance of these structures back in the time is worth knowing. The heritage walk is more like a leisurely stroll at one's own pace with or without a guide. It is the best way to explore the heritage monuments when travelling on a tight schedule. The walk usually begins in the morning, and the city landscape, the slopes and the hills make the walk an interesting one under the clear Shimla skies. The monuments and the scenery add to the beauty of the location which cannot be compared with any other place in the country. The heritage zone has a breathtaking collection of heritage monuments, and the walk is sure to give you a glimpse into the fabulous past of Shimla and must be taken by everyone visiting the city. Gorton Castle is a heritage monument located in Shimla which is over a century old and was built during the Colonial era. Today, the castle is used as the office of the Accountant General of Himachal Pradesh. It is a perfect illustration of the rich history and heritage of India during the colonial era. The monument is built according to the Neo-Gothic type of architecture and exudes the vibe of a fairy tale with its characteristic features. The castle is located on a hilltop and is surrounded by tall lush green Deodar trees. The sight is a treat to the eyes from afar, and tourists are bound to love exploring this heritage monument. Gorton Castle was built in 1904 and was designed by Sir Winton Jacob who was considered as one of the best British architects during the time. The scenic beauty of the location makes it look incredibly majestic. Many people say that the castle has a magical vibe too with its stone structure and glass windows that take visitors back to the bygone era. The traditional Rajasthani Jali work on the balconies is a feature that shouldn't be missed noticing. Sir Winton Jacob had included several forms of craftsmanship in the castle architecture and in the designs made for several other monuments he had designed. The castle is located in the Shimla Heritage Zone and is included in the Heritage walks held by several organisers in the city. The Bantony estate is a heritage site built during the British era and is located on Bantony Hill in the city of Shimla. The estate consists of the Bantony Castle and the Bantony Cottage. The estate now comes under the Heritage Zone of Shimla and is included in the Shimla Heritage walk for tourists. The beautiful wooden architecture of the building amidst the sprawling lawns is a site worth exploring. Although the estate is in the process of refurbishment and renovation, some parts are still in ruins. Tourists often speak about the melancholic vibe these portions of the estate posses. The potential of this heritage monument as a tourist attraction cannot be denied, and hence, the government purchased the property from the owners to rebuild it for the generation of today to get a glimpse into the British Colonial era. Rothney Castle is a heritage monument located on Jakhoo Hill on a steep slope amidst lush green natural vegetation. The site is a treat to the explorer due to its historical significance and the natural beauty of the location. As one climbs up the steep slopes of the Jakhoo Hill, they are bound to be greeted by the enchanting chirping sounds of the birds. The beauty of the ruins increases ten folds by the colourful wildflowers and wild berries growing around. Most explain the site as ordinary or in a dilapidated state while many find it to have a unique quality that attracts tourists from all over the world. Rothney Castle was once home to a British officer, A.O.Hume who is also known as the Father of Ornithology and the founder of the Indian National Congress. It comes under the Heritage zone of Shimla and is included in the Heritage Walks for tourists. Today, the castle is surrounded by lush greenery that resembles an overgrown or a rarely maintained garden. The site is of immense historical and architectural significance in India. This is proven by the stamp published by Indian Post in 2013 as a tribute to A.O.Hume. The environment around the historic monument has a unique tranquil effect on a person. To witness that, one must visit the castle while exploring the quaint little town. Bharara Fair is held every year in the Village of Bharara in Shimla on the 1st of May every year which is also called the 1st of Jaishtha. It is held in the honour of Lord Koteshwar, locally known as Devta and is open for people belonging to all caste and creeds. The fair is an event where everyone comes together to celebrate and seek blessings from the Lord. People attend in large numbers to honour Lord Koteshwar. They come beautifully dressed in colourful traditional clothing and stunning jewellery and accessories. The sight makes it a splendidly vibrant event. Locals and tourists of all age groups attend the fair to witness the authentic spirit of Bharara Village. Bharara Fair has been celebrated since ancient times in Shimla. A procession of Lord Koteshwar is taken out to the streets with great enthusiasm. The idol is beautifully decorated with colorful clothing and jewelry. Devotees sacrifice goats for the Devta as an offering and perform the traditional Nati Dance. The Nati dance is a traditional folk dance of Himachal Pradesh. It has been titled as the most massive folk dance in the world by Guinness Book of records as it has thousands of dancers participating in the performance. The fair also has fun rides, kiosks selling gifts and souvenirs and some food stalls selling delicious local food. Explorers who are always in search of a new location and wish to experience new customs, rituals, and traditions must not miss attending the Bharara Fair in Shimla. Ice Skating is a famous sport in the beautiful city of Shimla. The Shimla Ice Skating Rink is well-known because it is a naturally formed rink found in the town and is also the largest and the only naturally formed rink found in South Asia. It draws not just the locals but tourists from all over the world. Ice skating is thus a favourite sport for one and all here, especially during winters. The experience of indulging in a sport at the foothills of the Himalayas is a breathtaking one. Families and friends often visit the rink to spend some fun and quality time with each other and create beautiful memories. The ice skating rink has been used for sports and recreational activities since 1920. The Ice Skating Club of Shimla maintains it who enthusiastically host national level competitions and the annual carnival. Global warming and an increase in urbanisation are said to be causing a decrease in the events as it affects the ice formation in this naturally formed ice skating rink. The number of events arranged here is dependent on the weather and the ice conditions, but the popularity of the rink is unmatched. The Christ church is Shimla is the second oldest church in the entire northern India and is a site of pure devotion as well as architectural beauty. The church, which took 11 long years to complete, today stands as a reminder of the British colonisation in India. There is something unique and exciting about the Christ Church that makes it the favourite destination of people of all age groups. At night, the church literally glows when it is lighted up, while in winters, it dons the look of a magnificent castle. The Christ Church was originally built at the request of the British and Anglo-Indians residing in Shimla, who wanted a holy place where they could pray to their Lord, Jesus Christ. The result of their request is this marvellous and magnificent church, the foundation stone of which was laid down in the year 1844. The yellow building and its silhouette is visible from far across in the town of Shimla and is always full of architecture lovers, and devotees who flock to this place is large numbers all year round to enjoy serenity and peace in the lap of nature. The rich historical significance of this place has rendered this church to be a significant legacy of colonial India. The church is inspired by the neo-gothic style of architecture and is complete with a front porch, church bells and five stained glass windows that represent different virtues of Christianity. The Christ Church is now the only place of religion that the Christians have and is open for service every day. Even with the hullaballoo outside at the Ridge, the church is peaceful and indeed removed from reality. This and the fact that this majestic church has appeared in a number of famous Bollywood movies, such as Black and 3 Idiots, makes it a popular tourist attraction that people love to visit.